Apart from the two simultaneous concerts on 25th June 2010 in Mumbai, yet another concert is being held on 26th June 2010 as a tribute to Madanji. 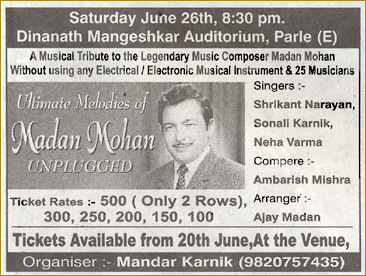 This show is being held at the Dinanath Hall in Vile Parle (Mumbai), and is also called MADAN MOHAN UNPLUGGED. Within a spate of 24 hours three concerts of Madanji are being held in his memory in Mumbai itself. Indeed Madanji and his music are still so fondly remembered by music lovers.